54 calendars have been purchased since Saturday, November 24th. The quality of the printing from Cafe Press is quite good (see the photos). I've had positive feedback about the calendar grid for actual use as a calendar, as the days in the grid aren't covered with images or text. The Sketchtoon Calendar Set on Flickr has been viewed 2,500 times. Both the Vertical and Square iPhone/iPod/Palm wallpapers have been popular. The original Sketchtoon Calendar post from my blog has the number 1 position in natural search results on Google. It's been an interesting and fun experiment. I'm learning new things, and have been meeting many interesting people through the project. The calendar still has a brief window of opportunity for sales, probably through mid January or so. I'll be interested in seeing where sales go from here — hopefully I can earn a few more sales before 2008 arrives. 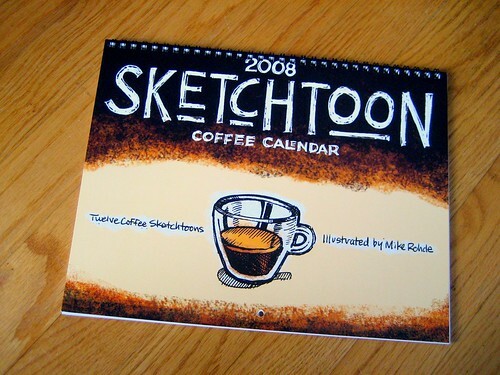 Buy the Sketchtoon Calendar: 2008 Sketchtoon Coffee Calendar: $19.99 + shipping. I just received my coffee calendar in the mail, and I am very pleased Mike. It's clean and clutter free, and will look great right next to my calendar. Perhaps next year you think about creating a 1 image dry erase calendar for those of us who like to see the year (or 18 months) at a glance, with room to write goals and such on the side. Thanks for the ideas Phil, I am exploring variations on this theme with the same artwork, and new ideas for 2009. Looks like a great Christmas gift. Thanks Ed: Merry Christmas & Happy New Year to you! Christopher: Glad you like the calendar! It's always nice to know that my work is appreciated ��I hope you enjoy it in 2008! Bought your calendar. Love it! Great to have something I really like that is personal because its made by someone I know and like. Mike, I've just got the calendar and indeed the print looks phenomenal. Keep your art high and best wishes for 2008!!! Thanks Janet & Javier -- very happy to hear you like the calendar design and quality of printing. I'm very pleased with it too.